Neurology is a branch of medicine that focuses on the disorder of the nervous system. Neurology focuses on the diagnosis and treatment of all categories of conditions and diseases that surround the central and peripheral nervous system along with the subdivisions, such as the autonomic nervous system and somatic nervous system. This includes the effective tissue covering, blood vessels. Neurological relies heavily on the field of neuroscience and the scientific study of the nervous system. A neurologist is a doctor that specializes in neurology and trained to investigates and diagnose neurological disorders. The neurologist also may doi clinical research, clinical trials, and basic research, translational researcher. Neurology is the non-surgical specialty, with neurology and surgical specialty is neurosurgery. Much of the work that neurology study is focused on neurological disorders. Neurological disorders are any disorder of the body’s nervous system. These could be structural, biochemical, or electrical abnormalities, which exist in the brain, spinal cord and other nerv3s that result in a variety of symptoms. These symptoms can include seizures, confusion, pain, poor coordination, loss sensation, and impaired levels for consciousness. There some many common disorders, however, many are rare. These disorders are typically assessed by neurological examination. There are interventions for neurological disorders that involve preventative measures, such as lifestyle changes, therapy, physiotherapy, neurorehabilitation, medications and pain management, and procedures performed by neurosurgeons. What are the main causes of neurological disorders? There several different factors that affect the brain the development of neurological disorders. Although tough membranes protect the brain and spinal cord, and shielded by the bones of the skull and spinal vertebrae, and chemically separated by the blood-brain barrier, the brain, and spinal core are very venerable to being compromised. Although nerves tend to be deep under the skin, they can become damaged. Individual nerves and neural networks are at risk for an electrochemical and structural disturbance. Neroregination may occur in the peripheral nervous system and can overcome some of the damage was done to the neurons and normal. However, this is thought to be rare in the spinal cord and brain. The different factors that affect neurological problems vary, these include genetic issues, congenital abnormalities environmental health, such as malnutrition, or disorders, infection, lifestyle choices. 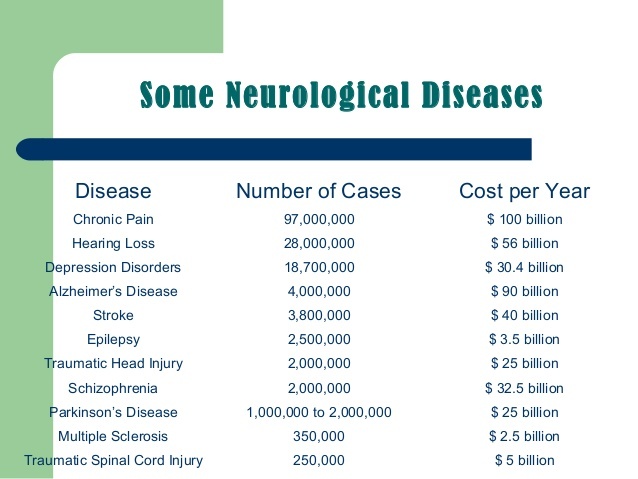 Neurological disorders can be classified according to the primary location affected. The primary type of dysfunction associated, or the main type of cause, the broadest division is between central nervous system disorders and peripheral nervous systems disorders. The Merck Manuel list these brain, spinal cord and nerve disorders that are in the following categories. Sleep Disorders such as Narcolepsy. Migraines and other types of headaches, such as tension or cluster headaches. Neck pain and lower back pain. Nueriosychiathic illness, These are diseases or disorder with psychiatric features, associated with known nervous underdevelopment, biochemical anatomy, or electrical malfunction, and /or disease pathology, such as attention deficit hyperactivity, disorder, Autism, Tourettes syndrome and observes compulsive disorder. Delirium and dementia such as Alzheimer disease. A neurological examination can be used to assess the impact of neurological damage and disease on brain function regarding behavior, memory, cognition. Behavioral Neurology specializes in the area. Alos clinical neuropsychology uses neuophsycicalogical assessment to identify and track problems of mental function. This is usually some brain injury or neurological impairment. Alternatively, a condition might initially be detected through identified abnormalities in mental functioning. with further assessment, doctors may be able to indicate an underlying neurological disorder. There are are some unclear boundaries in the duration of the disorder treated with neurology and mental disorders and treated within the mental order specialty of psychiatry. Conditions that are classified as mental disorders, or learning disabilities and intellectual disabilities, are not themselves are usually dealt with neurological disorders. Biological seeks to understand mental disorders in term of their brain in the nervous system yet clinical practice; the mental disorder is usually indicated by a mental state examination or another type of structured interview or questionnaire process. Today neuro-imaging (brain scans) alone cannot accurately diagnose a mental disorder or tell the risk of generating one; however it can be used to rule other medical conditions use as a brain tumor. As you can see, the nervous system is complex, in many cases neurologist will likely specialize in a particular area of concentration. They will do a fellowship in that follow residency training. Subspecialties have developed to narrow a doctor’s focus. If you are going to visit a neurologist, some common neurological procedures are taken. During your initial appointment with a neurologist, they will typically perform a physical exam and a neurological exam. A neurological exam will test muscle strength, coordination, and reflexes. Since different disorders should have similar symptoms, your neurologist may need more testing to make a diagnosis. This procedure can aid your neurologist determining if you have myasthenia gravis. In this test, your physician injects you with a medicine called Tensilon. Then they observe how it impacts your muscle movements. With electrodes placed on to your scalp, an EEG willmeasure electrical activity in the brain. Neurologists may use other kinds of tests, as well. Although they may not conduct the test, they may prescribe it, review it, and interpret the results. There is a diagnostic test that includes sleep studies and angiography. Angiography helps identify and decides blockages in the blood vessels going to the brain. Your neurologist may casn you in managing your symptoms and neurological disorder alone, or with your primary care physician and other specialists.